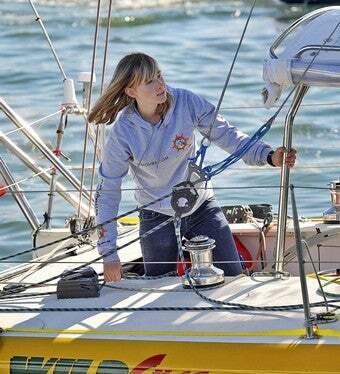 Sixteen-year-old Abby Sunderland has reportedly gone missing at sea during her attempt to be the youngest person circumnavigate the globe. Her parents are understandably worried — but many wouldn't have let her go at all. A junior from Thousand Oaks, CA, Sunderland hoped to be the youngest person to sail around the globe by herslef. According to Pete Thomas GrindTV, 16-year-old Jessica Watson set a new record last month, but Sunderland continued her journey — and faced severe storms in the Indian Ocean last night and early this morning. ESPN reports that Sunderland last talked to her parents around 9 AM Eastern Time today, after which she lost satellite contact and turned on emergency beacons that "indicate that she is in trouble." One beacon is attached to a raft or survival suit and apparently meant for use after abandoning ship. Thomas writes, "Abby's father struggled with emotions and said he didn't know if his daughter was in a life raft or aboard the boat, or whether the boat was upside down." Sunderland is 400 miles from the nearest ship, but rescue efforts are underway. Abby's parents have, in some ways, been through this before — last year, Abby's then-seventeen-year-old brother Zac also sailed around the world. At the time, I remember my parents saying they never would have let us do a thing like that (I can't speak for my brother, but I wouldn't have had the skills or the courage to try it). I don't have children, but I'm pretty sure I would have a complete meltdown if someone I loved tried to sail around the world alone. So where's the line between chaperoning kids at every step and allowing them to do too much, too soon? I know that he'll have rough times, but I'm not worried because the boat is in good shape and he's got a lot of good equipment, a lot of experience and a lot of support. The end result is that he's going to experience a huge range of emotion and experience and struggles and successes that are going to make him into an incredible man. Later, she said of her daughter's attempt to follow in Zac's footsteps, "Could there be a tragedy? Yeah, there could be. But there could be a tragedy on the way home tonight, you know, or driving with her friends in a car at 16. You minimize the risks." Are the Sunderlands — or, say, those of 13-year-old Jordan Romero, who recently became the youngest person to climb Mt. Everest — reckless, or have they simply given their children the freedom to reach for their goals, even if the consequences are dire? Zac Sunderland does seem to have benefited from his experience — according to his website, he is now "speaking around the nation to youth encouraging them to put wheels under their dreams and looking for his next adventure." And Jesse Martin, another young circumnavigator, once said, "If I never came back it would not have been a tragedy ... a tragedy would be someone who dies at 80 and spent 80 years not being satisfied. I was out there doing what I wanted." Ultimately, it's not clear how parents should balance the ills of overprotection with the desire to keep their children safe. But one thing's for sure: we hope Abby Sunderland's okay.